APPSC Group-III Panchayat Raj Secretary Posts Syllabus, Exam Pattern 2019: New Syllabus for APPSC Group-III Panchayat Raj Secretary Posts recruitment, Group-III Panchayat Raj Secretary New syllabus, Selection Process, Scheme of selection, examination pattern, Exam scheme, syllabus. 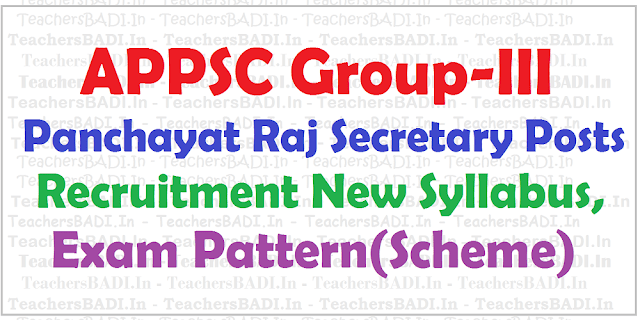 APPSC Direct Recruitment, Guidelines, Panchayat Raj Secretary Posts Recruitment,Filling up posts, Group III Serves posts, Group-III Exam Papers, Group III Examination Pattern and Scheme, Group III Exam new Syllabus. AP Government has given permission to fill in Group-III Services Posts in various departments, through direct recruitment. Scheme and Syllabus for Panchayat Raj Secretary Posts(Grade IV) Recruitment in AP Panchayat Raj Subordinate Service.